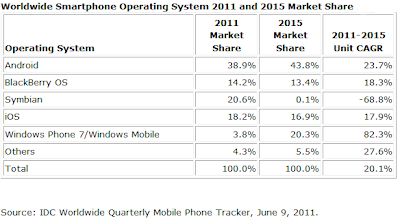 According to the latest IDC report regarding Worldwide Smartphone Operating System Market Share, IDC has declared that the Microsoft's Windows Phone 7 will overtake the market share of the Apple's iPhone by 2015. In fact under the figures, the iPhone market share would decrease with Android taking the lead with 43.8% in 2015. Google's Android will keep its top spot in 2015, grabbing almost 44 percent of the global market, while Apple's iOS will hug third place with a 16.9 percent share. The researchers believes that by switching to Windows Phone as the core OS on its devices, Nokia will provide the kick that Microsoft needs, especially in global regions where Nokia has enjoyed robust demand. Microsoft's mobile OS will continue to hang onto a small chunk of the market until 2012 when IDC expects Windows Phone-equipped Nokia devices to start shipping in large numbers. IOS's market share is expected to inch down from its current 18.2 percent, Apple will still see a dramatic increase in smartphone shipment growth through the end of 2015. In second place this year, Symbian will quickly lose market share as Nokia phases it out in favor of Windows Phone. By 2015, IDC sees Symbian's market share as virtually nil. The IDC Report also mentions the decrease of the iOS and BlackBerry slightly due to being squeezed, essentially, into a smaller area of the market. They place the reasoning for Android's growth on the popularity it has with phone manufacturers and vendors.